One of the most bittersweet parts of the wrestling season every year is cleaning out our locker room. Anyone who knows me, knows how much I love coaching wrestling and helping our kids achieve great things, so it’s always a little sad when the season comes to an end. It’s sad to see our seniors move on from the program, but it’s amazing to think about how much they’ve grown in their time here. So there I was last week, cleaning out the locker room with Bill Magner – our head assistant coach. We’re taking down stuff off the walls, putting all of our equipment back into storage, throwing out any garbage left behind. Finally we finished and I was getting ready to leave for the night, when I realized we had cleaned everything else, but we forgot to erase the white board. I sat there and looked at it for a second and wasn’t sure exactly how I felt. Then I realized I had this huge smile on my face. I looked at the board one last time before I erased it and I realized I had to take a picture. 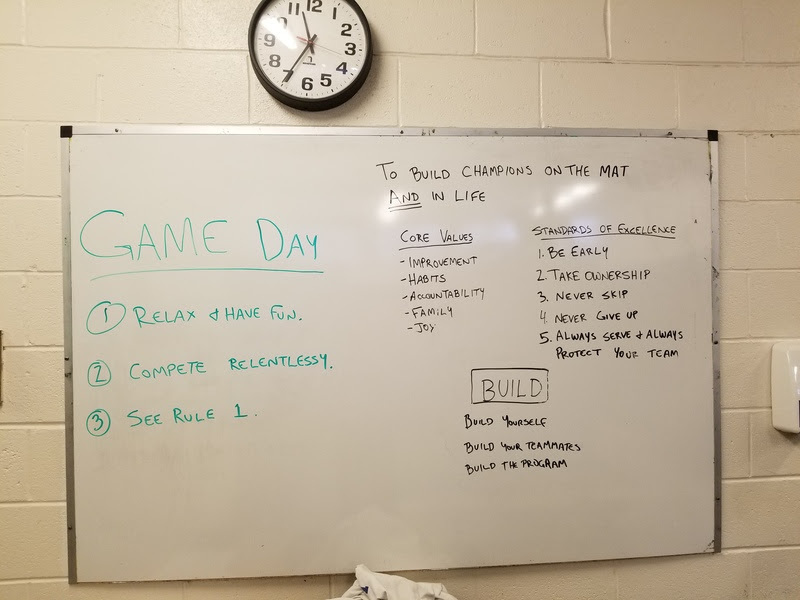 If you were a complete stranger to our program, if you knew nothing about Edgemont Wrestling, nothing about our kids, nothing about our coaching staff, you could look at this white board for about 10 seconds and understand exactly what our program is about. There’s so much here that defines our program’s identity. Everything on the right side of the board was written there the first day of practice, and here we are, four months later, and it was still there untouched. Our kids come in everyday and it’s the first thing they see. It’s the last thing they see each evening when they leave. It sums up our program so perfectly. There’s a lot to think about here, but, for us, it all starts with what’s written in the top right corner. The “and” is really everything to us. The “and” is what sets us apart, gives our program an identity and makes it so special. I truly believe it’s that one three-letter word that describes why so many of our wrestlers go on to achieve great things, and why we have such an amazingly supportive and involved family of supporters, parents and alumni. So many programs focus solely on winning games. There’s nothing wrong with that. We’re an athletic program – we’re here to compete. But if that’s where the focus ended for us, we’d be falling short and we’d be doing our kids a tremendous disservice. You’ve all in been involved in Edgemont wrestling, in one way or another, so you guys all know that we do things here a little differently. We set the bar really high in terms of what we expect from our student-athletes. So it’s only fair that we set that bar equally high for our coaches and model the expectations for our kids. For the kids, those expectations revolve around huge commitments to themselves and each other, and working their butts off day-in and day-out to become the best they can be on the mats and off. We expect them to ultimately excel on the mat as a product of the effort and time they put in, and we expect them to excel in the classroom, in their relationships and in their other responsibilities, again, because of the time and effort they commit. Why can’t we be the best wrestling program in New York State and also the single best platform to prepare kids for whatever life might throw at them? Why can’t we care deeply about building State Champions and also care deeply about building great people? I know that we can. Every wrestling team in New York State – every wrestling team in the country, for that matter – practices two hours a day, five to six days a week, four months a year. Every wrestling team out there spends that time teaching technique, drilling, live wrestling and conditioning, trying to mold their athletes into winners. That’s not special. That’s the baseline expectation. That’s where our “and” come in, and that’s where it differentiates us. For us it’s much more that. For us it’s the team building retreats and the semi-weekly team meetings centering on core values. It’s the travel to some of the toughest tournament in the State to put our kids in difficult situations, the mindset training, the morning lifts, the film review sessions… it’s all of these things that go above and beyond that baseline, that teach our kids that remarkable achievements are born from remarkable efforts, that no challenge is too great to overcome, that a focus on the important things that make you a better person will also make you a better wrestler. None of that happens without you guys reading this email. So, honestly and sincerely, from the bottom of my heart, THANK YOU! You guys ARE our “and”! Our Annual Giving Campaign funds so many of these types of initiatives that our school budget does not. I should probably start calling it our “Annual AND Campaign”! We have a few more weeks left and we could really use your help. Our goal is 60 donors and every gift helps no matter the size. Whether you can help or not, PLEASE take a look at why a gift to our program is so important to making the process a reality. AND thank you so much for your support!